Attaquin Weeden traveled from Mashpee to lead the traditional dancing at the Aquinnah powwow. 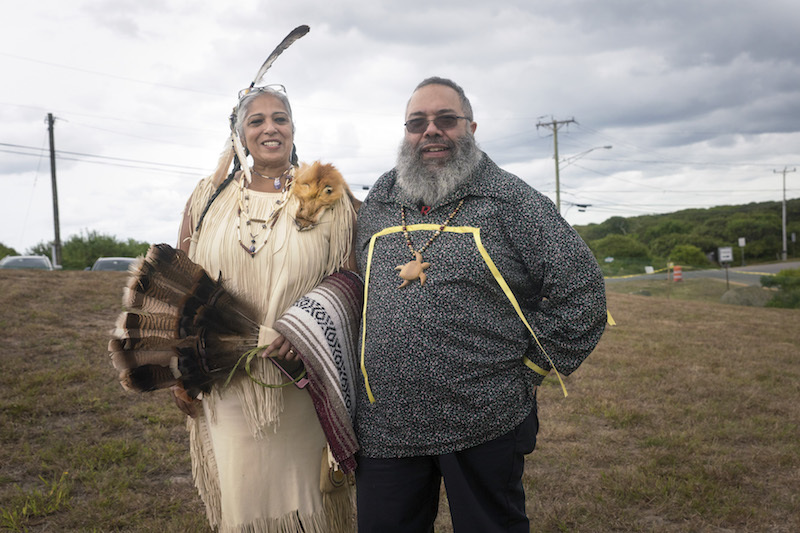 With a festive panoply of traditional songs, dance, food — and one marriage proposal — the Wampanoag Tribe of Gay Head (Aquinnah) hosted their 14th annual powwow at the Aquinnah Circle this weekend. Powwows are both ceremonial and social in nature. 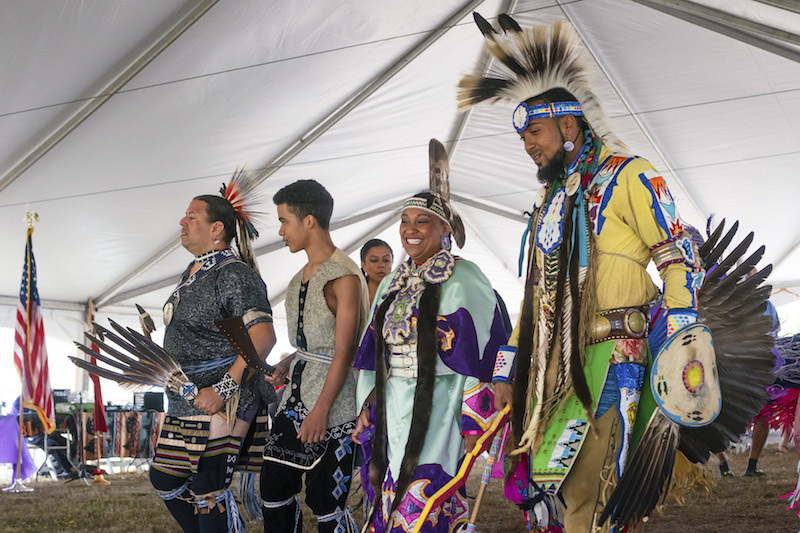 Because this weekend’s powwow in Aquinnah was an inter-tribal event, native peoples with ties to the Wampanoag came from every corner of Massachusetts to partake in the ceremonies, see family, and share in time-honored traditions. The event opened with a grand entrance, led by chairman of the Wampanoag tribe of Gay Head (Aquinnah) and tribal chief Ryan Malonson. Aquinnah police chief Randhi Belain carried the stars and stripes, while Woody Araujo bore the Massachusetts state flag. 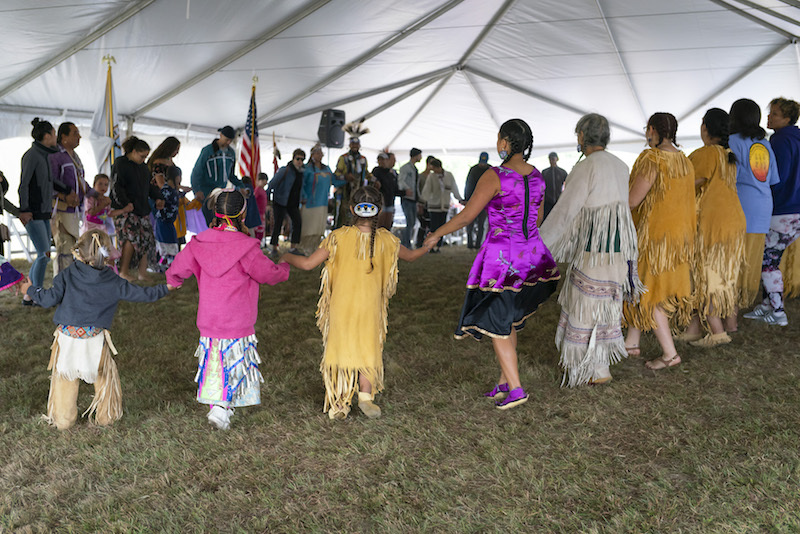 The celebration included ceremonial dances, such as the veterans dance and memorial dance to honor tribe members who died the past year, along with more jovial numbers, like the men’s grass dance, women’s leg dance, and the duck-and-dive. “That last one is my favorite,” said head male dancer, Attaquin Weeden. 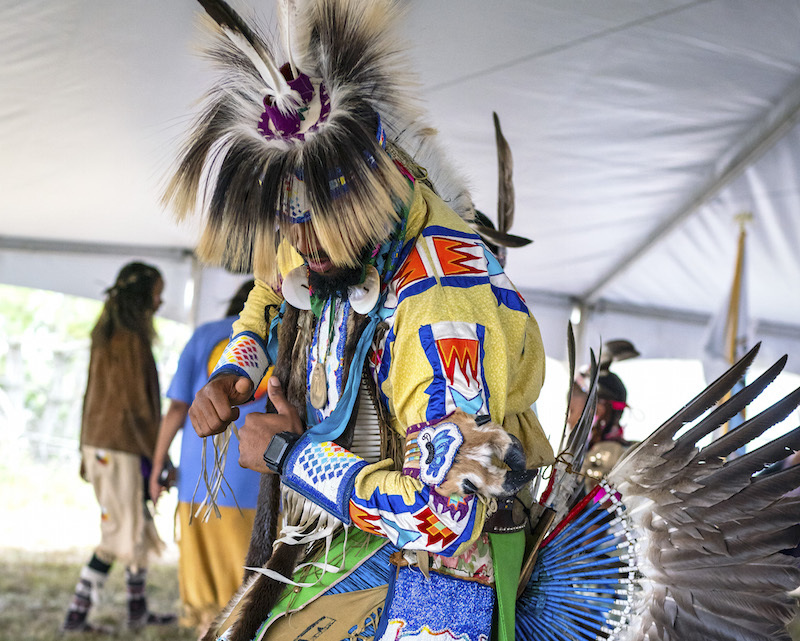 Not only is the head dancer tasked with guiding powwow participants on the dance floor; he is also considered an example for how Wampanoag should carry themselves when the music isn’t playing. During the duck-and-dive, dancers have to avoid “cannon fire” as represented by loud drum bangs through choreographed ducks and dives. Mr. Weeden came up from Mashpee to lead the ceremonies. “This is our sister tribe, so whenever I come around it’s like seeing family. There’s always big smiles and laughs when you’re with the family,” Mr. Weeden said. “I love the bluffs because all of the red on the rocks reminds me of the stories I was told about the cliffs as a kid,” he continued. In Wampanoag tradition, Moshup would fling whales onto the cliffs to feed native peoples, giving them their characteristic dark red color. For Mr. Weeden, powwows present a rare opportunity to take a break from work and spend time with family. “I work in asphalt, but got laid off at the end of summer so now I can work on my regalia,” he said. Mr. Weeden’s been dancing since the moment he could walk, and his outfit included a headscarf made from porcupine quills, white deer hair and eagle feathers. In attendance were his father, cousins and great-great grandfather. “The only one older than him is the drum,” Mr. Weeden said. Scott Reels, who also came from Mashpee for the powwow, sang in a drum circle with the group Eastern Suns. “The drum is our grandfather,” Mr. Reels said. He’s been singing since he was five years old, and learned most of the music by rote memory while he listened to his elders play. “We respect the drum as our grandfather and treat it as our grandfather,” he added. For Eastern Suns, that means no negative energy around the drum, caring for the moosehide and cedar instrument as if it were an ancestor, and wiping it clean with animal grease. Outside the performance tent, powwow participants enjoyed Sly Fox Den eatery’s “Indian tacos” made with venison, grilled onion and fried bread. While many people at the powwow came to see family, Brian Vanderhoop came to grow his. “Melissa Borgus, will you marry me?” the Fall River resident asked his stunned girlfriend in front of the powwow audience. Needless to say, Ms. Borgus consented. The Wampanoag Tribe of Gay Head (Aquinnah) couldn’t think of a better way to welcome its newest member, all in the spirit of powwow.